Solving problems one sheet mask at a time with St. Tropez, NeoStrata and Life Brand! 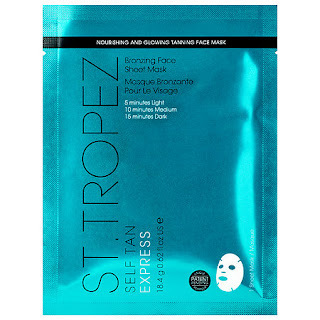 St. Tropez Self Tan Express Bronzing Face Sheet Mask - 1 mask - $10 - with a fast-acting formula that fuses hyaluronic acid and self-tanner to instantly revitalize your complexion with an ultra-hydrating dewy glow that develops into a long-lasting golden tan. The mask has been designed to work with the face’s natural contours, and the fibers ensure that it doesn’t slip resulting in a streak-free, even finish. What's really great about this mask is your ability to control the colour level: leave on 5 minutes for light colour; 10 minutes for a medium glow; and 15 minutes for dark bronzed beauty! A few tips for a better experience: apply a non-oil based moisturizer around hairline to prevent the tanner from discolouring your hair (especially if your hair is light); make sure you wash your hands thoroughly with hot water and lots of soap after applying the mask and blending; and if your skin has any areas of severe dry skin, dark pigmentation or areas of enlarged pores, blend a little moisturizer over top to help even things out. NeoStrata Hydrating & Plumping Sheet Mask - 1 mask - $8.50 - provides fast-acting relief for dehydrated skin. Featuring 0.15% pure hyaluronic acid, as well as a blend of botanicals, to fully rehydrate the skin and replenish its moisture barrier, while also enhancing its protection against external aggressions. On a plane ride with a seat mate that won't shut up? Slap this baby on and not only will buddy leave you alone, you will deplane without the usual parched skin caused by dry cabin air. Life Brand Deep Cleansing Facial Sheet Mask - 1 mask - $1.99 - with rose oil, cherry blossom and other botanical ingredients infused into a sheet mask to remove impurities, revealing a brighter, youthful complexion and leaving skin feeling hydrated, soothed and cleansed. Skin actually feels so clean after using you will really notice how much quicker and easier your usual skin products will soak in!